Plaques are a fantastic way to express yourself and add some personalisation to your decor. 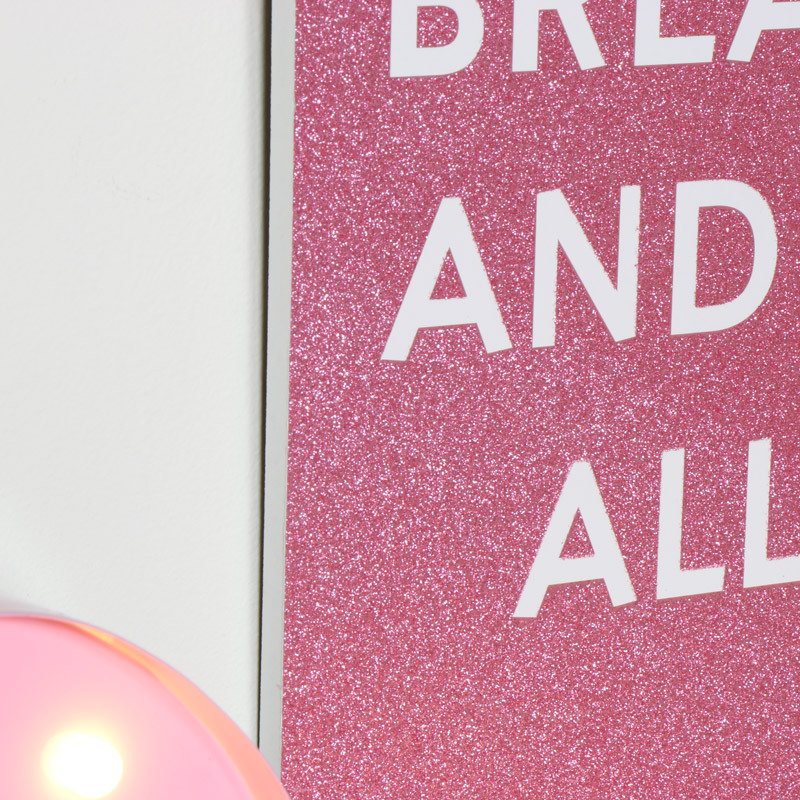 This pink glittery wall plaque will add some shine to your home. Add some sparkle to your decor and start the day as you mean to go on. This will make a fabulous gift idea. Decorated with the quote, "Eat glitter for breakfast and shine all day" in white tet against a pretty pink glittery background. Great contemporary chic design that will stand out and add some cheery sparkle to your day. Plaques are a fantastic way to express yourself and add some personalisation to your decor. This pink glittery wall plaque will add some shine to your home. 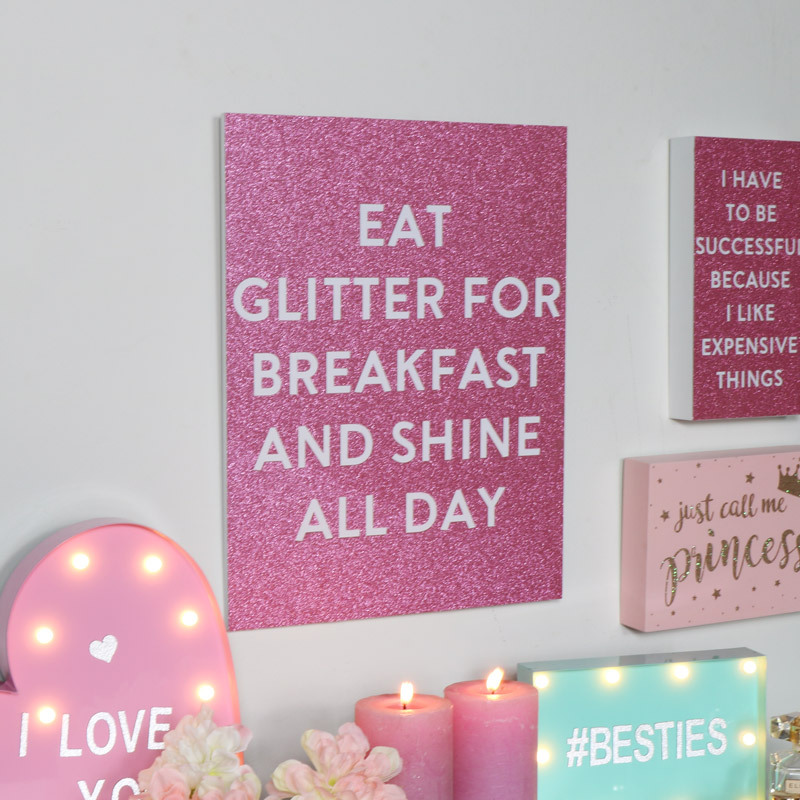 Add some sparkle to your decor and start the day as you mean to go on. This will make a fabulous gift idea. Decorated with the quote, "Eat glitter for breakfast and shine all day" in white tet against a pretty pink glittery background. Great contemporary chic design that will stand out and add some cheery sparkle to your day. Made from wood and decorated with a glitter pink background and white text. Easily wall mounted with a saw tooth hook on the back for wall mounting.